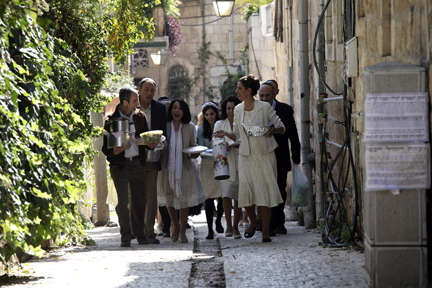 The Women’s Balcony, written by Shlomit Nehama and directed by Emil Ben-Shimon (Israel) 2016, begins with a tragic incident. An accident in a Jerusalem synagogue during a bar mitzvah seriously injures the rabbi’s wife and traumatizes the rabbi. Damage to the building interior and destruction of the holy scroll displaces the congregation. An attempt to hold prayer in a temporary location nearly fails before the arrival of a young rabbi and his students. However, the small Orthodox community is challenged by the stricter demands of the charismatic new cleric. The most serious problem develops along the gender line, dividing women from men. As the situation worsens, there’s a showdown in which the wives stand united. This charming dramatic comedy is currently playing at Lincoln Plaza Cinema, East 86th Street Cinema, and Quad Cinema in New York. It opens 9 June 2017 at Harkins Shea 14, Scottsdale; Cobble Hill Cinemas, Brooklyn; and ShowRoom Cinema, Asbury Park. Additional runs begin 16 June 2017 at the Clay Theatre, San Francisco; Camera 3 Cinemas, San Jose; Palace 17 Theater, Hartford; Bethesda Row Cinema, Washington; Siskel Film Center, Chicago; The Charles, Baltimore; and Edina Cinema, Minneapolis. See www.menemshafilms.com for more information, including additional venues and dates.